The Toronto Region Groupworkers’ Network continues to provide opportunities for groupworkers to come together for mutual learning and sharing. 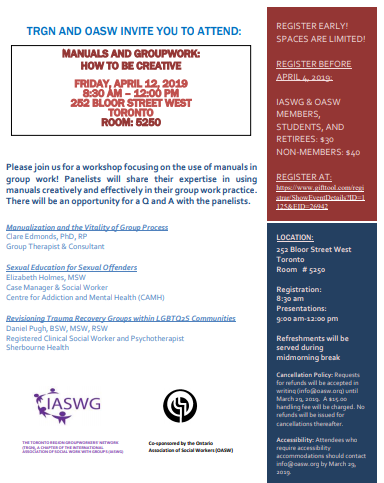 You are invited to join The Toronto Region Groupworkers’ Network (TRGN)! TRGN is a Chapter of the International Association for Social Work with Groups (IASWG), founded in 1979, the premier international association for social workers and allied helping professionals engaged in group work. The purpose of this non-profit, member-driven organization is to promote excellence in group work practice, education, field instruction, research and publication. The goals of the Association are realized through a program of action and advocacy at both the local and international levels. Your membership supports our mission. The TRGN chapter was established in 1982, one of the first chapters in the association and the first international chapter. We host exciting workshops and programs where local and international colleagues share ideas, resources, and innovative practice approaches to working with groups. We encourage participation in the annual IASWG International Symposium and are available to assist first-time presenters with how to submit abstracts and prepare articles for publication. 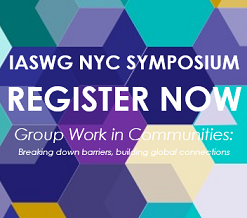 When you join IASWG, and designate the TRGN as your local chapter, you will receive membership discounts on all TRGN events and on registration for the IASWG annual symposia. For more information on the chapter and all chapter activities, contact the chapter at [email protected]​. To view a full description of the April event offerings, click here.